This wireless mouse is an upgraded version which is more suitable for big hands, It features ergonomic design, 5-level CPI, perfect wireless transmission, 8-minute sleep mode, and strong compatibility. 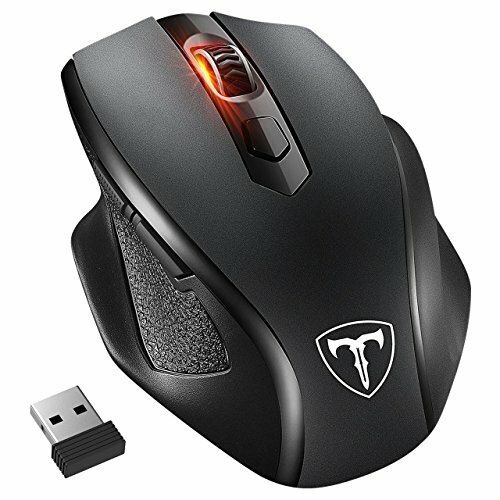 Equipped with a professional chip, this wireless mouse provides you with lower power consumption, more precise cursor control and more stable signal transmission. 1. The actual battery life varies with battery types, computer condition and your using frequency. 2. The two side buttons are invalid in Mac OS since Mac OS System is not open to public, but other buttons still work perfectly in Mac OS. Every Patuoxun Product includes a 45 Day refund, 18-month, worry-free Guarantee! Easy-to-reach support.